WASHINGTON — Bigelow Aerospace and United Launch Alliance said Oct. 17 that they are cooperating on the development of a habitat orbiting the moon that they hope to build in a public-private partnership with NASA. The companies said they are working together on a concept for a “lunar depot” using an expandable module provided by Bigelow and launched by a next-generation ULA rocket that could support both NASA and commercial uses as soon as 2022. Under the concept, a ULA Vulcan 562 rocket would launch the Bigelow B330 module into low Earth orbit. The module would remain in Earth orbit for up to a year to undergo tests and be visited by crews. ULA would then launch two more Vulcan rockets, each placing an Advanced Cryogenic Evolved Stage (ACES) upper stage in orbit. One of the ACES would refuel the other, which would then dock with the B330 and send the module into a low lunar orbit. The announcement build upon existing work between the two companies to study launching B330 modules, originally on the Atlas 5, Bigelow Aerospace President Robert Bigelow said in an Oct. 17 interview. He said his company decided to shift to the Vulcan vehicle and then build upon its capabilities, such as the ACES upper stage that is intended to also serve as a refuelable space tug. Bigelow emphasized he saw this proposal as a public-private partnership. He estimated NASA’s share of the costs to be $2.3 billion, in addition to the “hundreds of millions” being spent by both Bigelow Aerospace and ULA. “It’s executable within four years of receiving funding and NASA giving us the word,” he said. 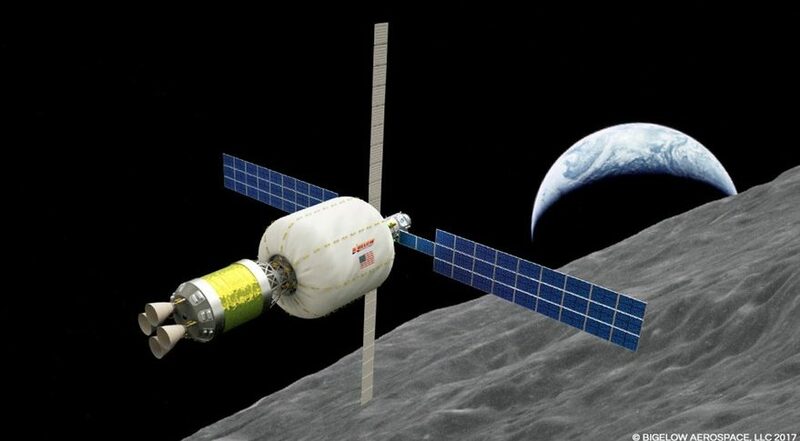 The lunar depot would be available for both NASA and commercial uses, according to Bigelow. It could be visited by NASA Orion spacecraft launched by the Space Launch System, but he said it’s possible other spacecraft, like a version of SpaceX’s Dragon spacecraft, could also provide transportation to and from the facility. The depot, he said, is not intended to be a replacement for the Deep Space Gateway, the proposed cislunar habitat announced by NASA earlier this year. That facility would consist of several modules, including some potentially provided by international or commercial partners, and support lunar missions as well as prepare for later expeditions to Mars. Bigelow said the initial depot could be supplemented by additional modules, or even other depots in different orbits, but that the companies want to keep the concept relatively simple for now. “We’re trying to keep it simple to get it done,” he said. Prior to the public announcement of the lunar depot concept, Bigelow said the companies had briefed several “key” but unidentified people in the U.S. government about it. “They’re excited about this,” he said, adding he believed that Jim Bridenstine, nominated to become NASA administrator in September, would also support something like this.